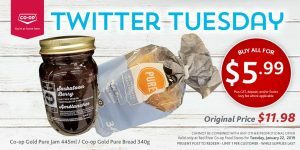 It’s Tuesday – time for another deal from Red River Coop. These deals are valid at Red River coop foodstores only – valid for today only. And it’s one per person. Today’s deal is a loaf of bread and a jar of Coop pure gold jam for $6 – about half price. Just show the picture at checkout to redeem.